Remember illustrator Michael Wertz, this funny guy, who interviewed himself here at 7-Imp in 2009 and blatantly disregarded the usual rules for pronoun use? 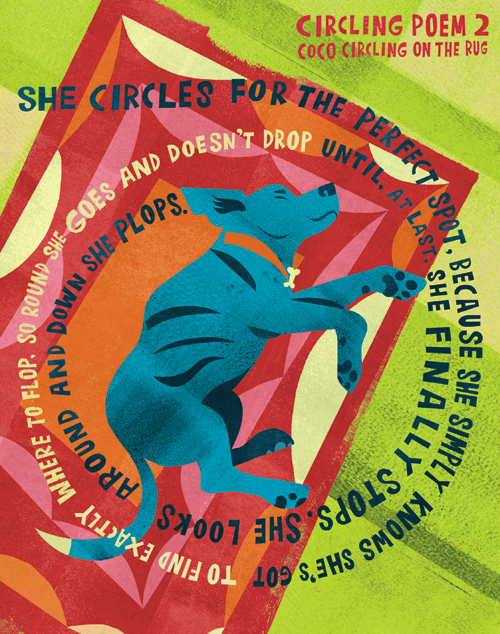 Here’s a quick post to show some illustrations from the follow-up title to the one featured in that post, Betsy Franco’s A Curious Collection of Cats. Just as with 2009’s cat title, this is a collection of concrete poetry — thirty-four poems, everything from haiku to free verse to cinquains. 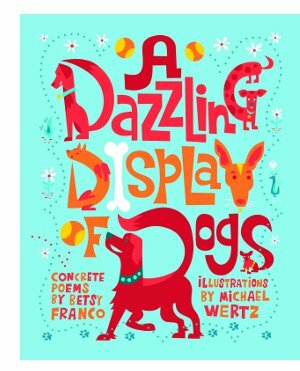 The very prolific Franco impresses again with this volume of visual poems, which capture a range of tones but primarily affectionate and sweetly goofy. And it’s all engaging fun. So are Wertz’s brightly-colored monoprints, a feast for your eyes. 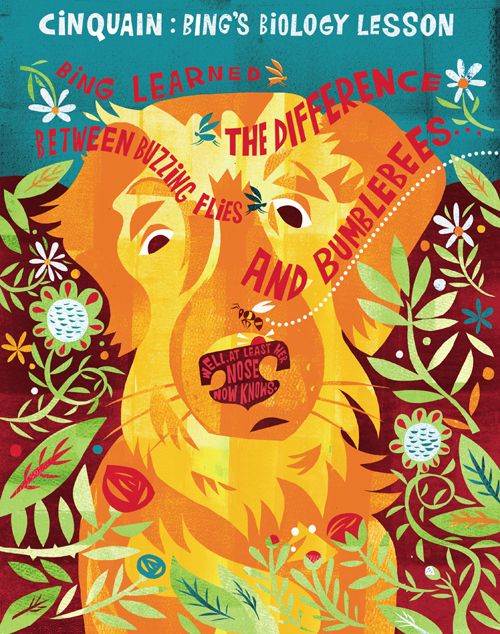 Many of the same elements that made the cat collection work are on display here again with this volume of canine poems, in which the text cannot possibly exist without the art and vice versa, these smart, witty poems embedded in images nearly bursting off the page. Since it’s way more fun—and much easier—to show you what I’m talking about, I’ve got some spreads to show you today. Enjoy. A DAZZLING DISPLAY OF DOGS. 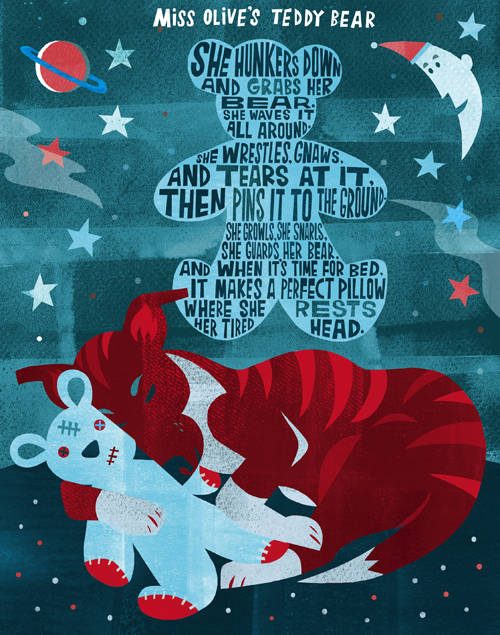 Text copyright © 2011 by Betsy Franco. 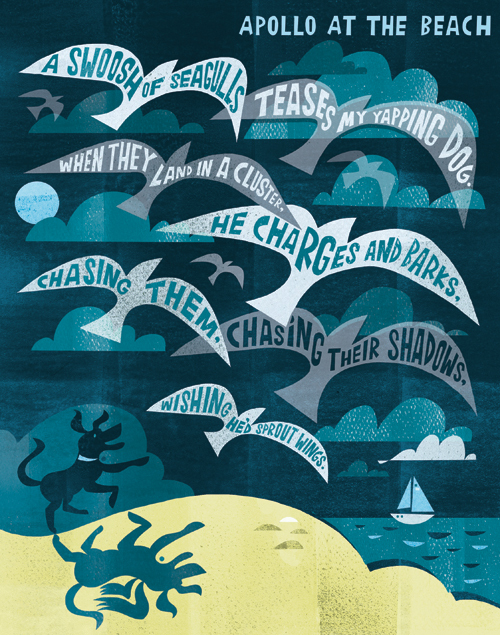 Illustrations © 2011 by Michael Wertz. Published by Tricycle Press, Berkeley. All images reproduced by permission of the illustrator. Love these – there’s never enough screenprinting in the world for me. And the colors, yum! Oh, how I love concrete poems. This is the perfect book — absolutely perfect marriage of art and words. Each image would make a great poster! Guess that’s what good art and poetry should do. Lovely!